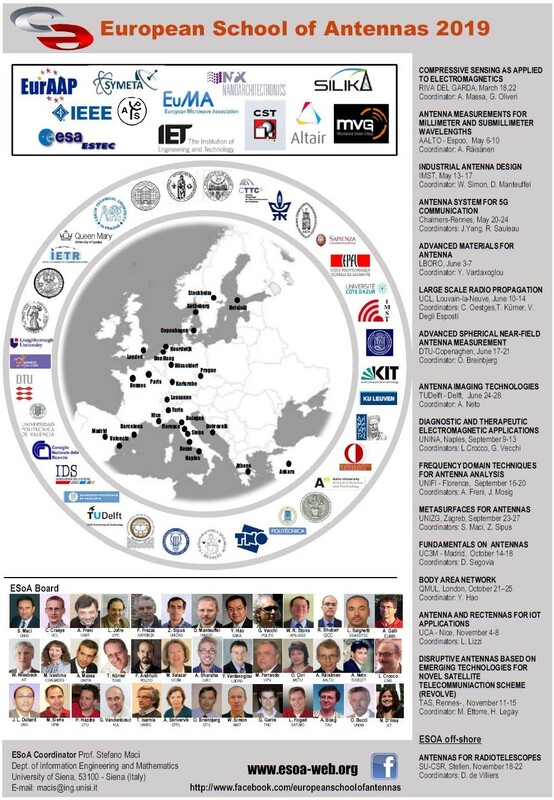 The European School of Antennas (ESoA), is a new model of geographically distributed post graduate school created thanks to the European Union support through the ACE NoE - Antenna Center of Excellence (2004-2007) and the Marie Curie Actions. The school is constituted by a highly qualified integrated set of advanced one-week courses, distributed in the most accredited European antenna research centers. 100 among the best European teachers present lectures in antennas and propagation. The courses are repeated every two years updating the content. facilitating the interchange of ideas among early stage researchers and teachers, thus increasing the future mobility and synergy. The school is furnished with a centralized WEB support and it is coordinated so that the courses have the same format and apply common basic rules for exams and credits.